Normally, once we sell equipment, we only hear from the customer again when they are ready to order something else. This is great because it means everything is working and our customer is happy. It is a real treat for us when a customer takes the time to send us a picture of their equipment in use. We love to see photos! We got an email from one of our customers earlier this month. He bought an Eagle 9,000 lbs 2-post lift in February and wanted to let us know how thrilled he was with his purchase. He also included a picture! Thanks Mark. It was our pleasure to serve you. First, I want to thank you all for the decals you sent me for my lift. It’s much nicer walking into the shop seeing the Eagle logo as soon as you come in. Second, I have to tell you that I absolutely love this lift. I was able to do the installation myself, with some help from some friends to lift the posts into position. The instructions that came with the unit were clear, simple, and walked me through the process step-by-step. I bought this lift after doing a lot of research on what is available and at what price. No doubt, Eagle offered the best bang for the buck. The use is primarily for my personal vehicles and as a hobbyist. I installed it in February 2015 and have used it quite extensively since. I worked in a professional garage for eight years as an auto mechanic, so I’m familiar with two-post, above ground lifts. 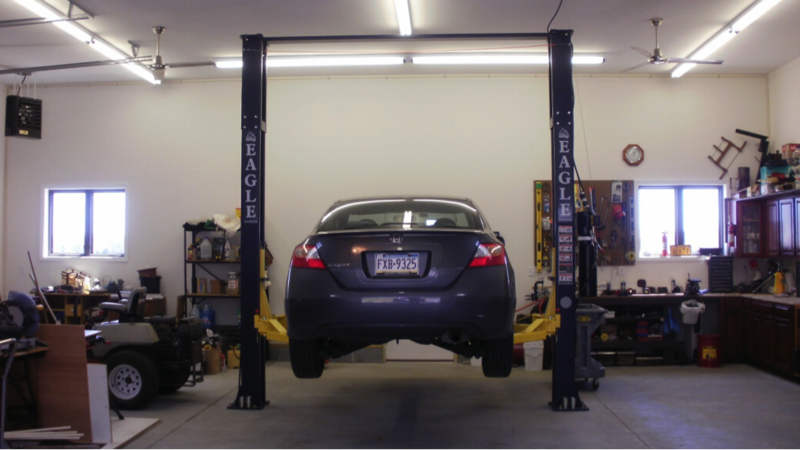 I can say first hand, this Eagle Lift is superior in quality, safety and performance to the lifts in the garage where I worked. 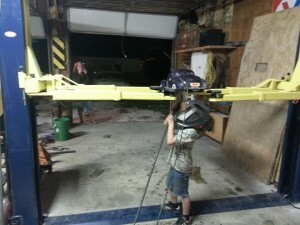 Bottom line…thanks to you all at Eagle Equipment for making a Quality and Affordable lift.